What do I think about the cover design? So into the typography. Of course, the thing I really love about this hardcover of Tease is the typography! Cursive, baby! The title looks like it was written out in reddish-pink pastels or a lipstick. The page of text that is under the title makes good use of the empty space. In person, the cover is silver than that dull gray that’s shown in the photo, which I like because it’s very shiny and eye-catching with that pin color. 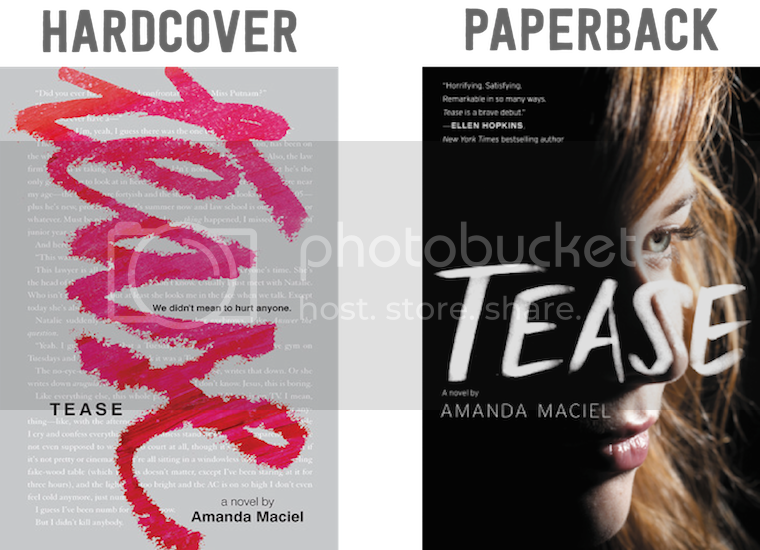 I don’t like the extra sans serif “Tease” on the left side of the cover. I just find that a bit awkward since we already have an eye-catching title. Would I buy this book based on the cover? Sure. What do I think about the cover design? It’s just okay? This paperback cover is very contemplative. It focuses more on the side profile of a girl than the typography of the title. It’s not the most innovative or creative cover (because we’ve seen sooo many profile covers), but I like the shadowing of it, especially how you can’t see the right side of the girl’s face which is shrouded by the dark. The typography for the title is more subtle than the hardcover—both in style (it’s not cursive anymore, boooo) and coloring. I miss the silver and the hot red-pink! Would I buy this book based on the cover? I don’t know. Maybe? Final Verdict: Definitely the hardcover!